Posted on November 27, 2009 at 8:30 am. I guess I should blame it on my investigative curiosity. 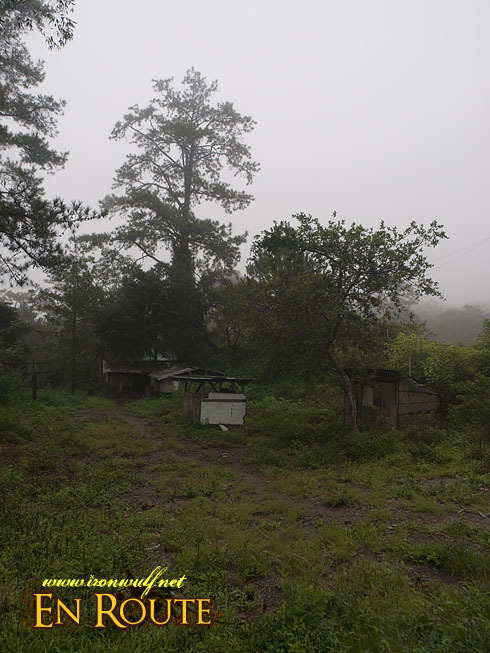 At the first day of exploring the haunted places at the City of Pines I was wondering what a typical local have to say about this. From my travels, I know, most of the time, people have stories to tell. And when it comes to ghost stories, I know, they have a lot more to share whether it be their own, or someone else. My instinct didn’t let me down when I asked our driver if he has any interesting ghost stories he experienced. And he does have a spine chilling tale from Loakan Road. The driver years ago started as a taxi driver. One night, he was headed back to the city center going through Loakan Road. He knew all about the stories of “White Lady” sightings on this unlit road but never believed them. When on a turn, he suddenly felt cold. His felt his hair on his back stood up and he started to have goose bumps all over. He looked up the rear mirror and he suddenly saw a lady on his passenger seat. Cold sweat started pouring out of his skin. He could not make out her face in the darkness. He reached out for the lights but suddenly the girl spoke “Wag nyo po buksan ang ilaw. Parang awa nyo na po, ihatid nyo po ako sa siudad (Please, don’t open the lights. I beg of you, help me. Take me to the city please).” He didn’t reply as every inch of his body was covered in fear. He stepped on the gas hard and didn’t care if he would crash into any vehicle up ahead. 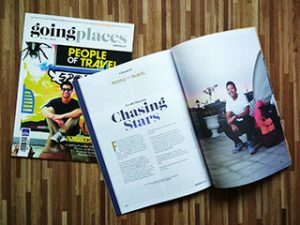 He wanted to reach the city as fast as possible and leave the blackness of Loakan Road. When he exited the road and entered the city, light poured in the car and the girl suddenly disappeared. He swears that it was the scariest thing that ever happened to him. 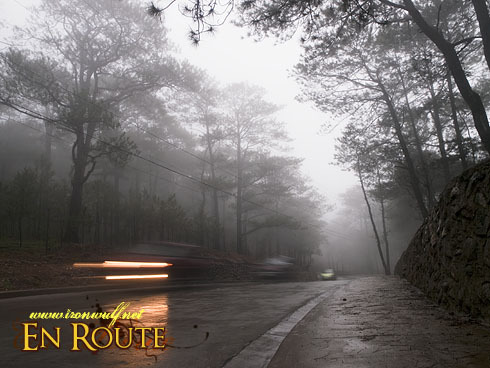 Whether our driver was telling a true experience or not, it’s worth noting that Loakan Road seems to be one of the centers of paranormal activity in Baguio. On its road stretch are two major sites of disaster from the 1990 earthquake. We paid a visit to the first one, the Hyatt Terraces Hotel. We heard stories that it was sprawling with spiritual activities. Our writer in the team consulted his famous psychic friend and said that most of the spirits there have moved on. I can’t verify if it was true but the site where Hyatt was, is now an empty lot and somewhat became a stable for horses. What are left now are the remains of their old fountain. Another major damage during the 1990 quake was Hotel Nevada just at the fore of Loakan Road. 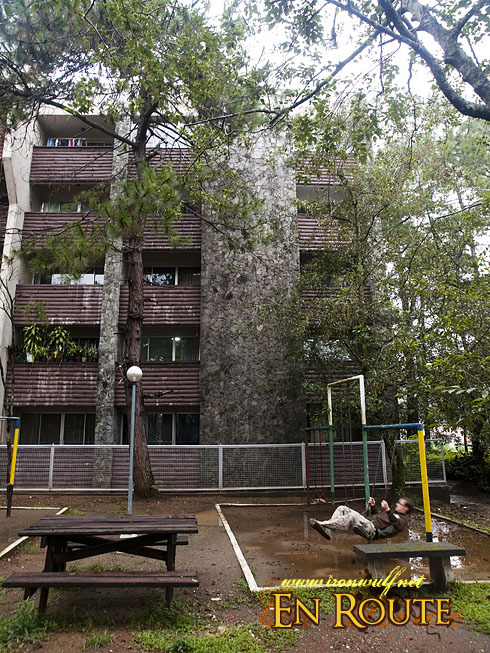 Its first floor was badly damaged and a lot of people were crushed dead inside. 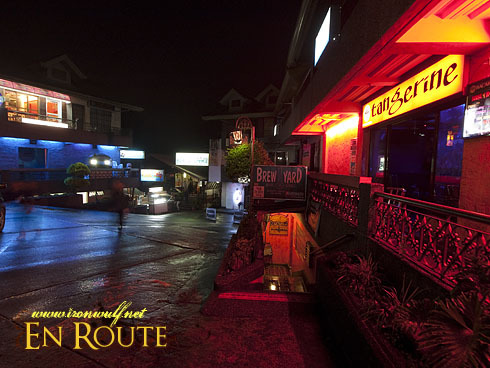 At the site, the place has become Nevada Square, one of Baguios premier places for night life. Rows of bars and restaurants fill the area. During the early days when it was starting, some restaurants repored a lot of ghost sightings and disturbances. One of the owners even called in the Spirit Questors to investigate. They did find spirits there and asked them to leave but things didn’t get better. The owner eventually left the restaurant because of the change in environment and the square turned into something more unpleasant. Drugs, scandals and murder have invaded the place. The ghost of Hotel Nevada may have gone but something more evil had replaced them there. We investigated another lead from this famous psychic friend of our writer. A compound I won’t name was said to be a “grid”. It was so strong when he was there because it was populated by elementals. We did check it out to find anything even splitting up to cover the place. There was nothing majorly unusual there aside from the uneasy silence of the place. 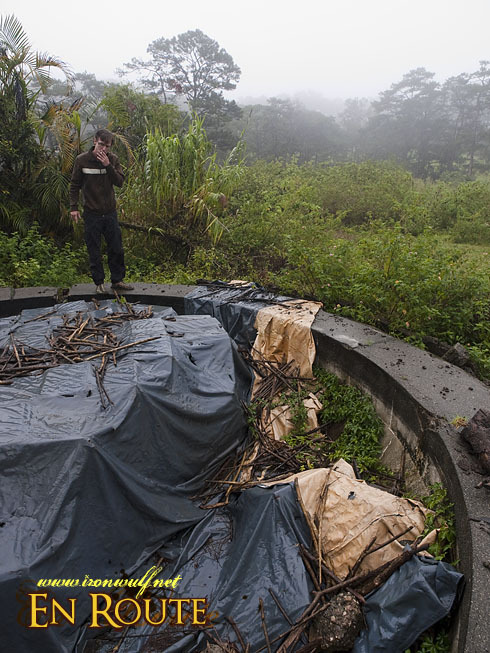 The hotel however found within the compound was another story in itself. The hotel building was eerie, even from entering the reception hall. I won’t even dare stay at its crummy rooms. Going back to Loakan road, there’s an American Cemetery there which was also said to be a popular place for White Lady sightings. There used to be crosses standing on each grave there but it was removed. Only the epitaphs remained. 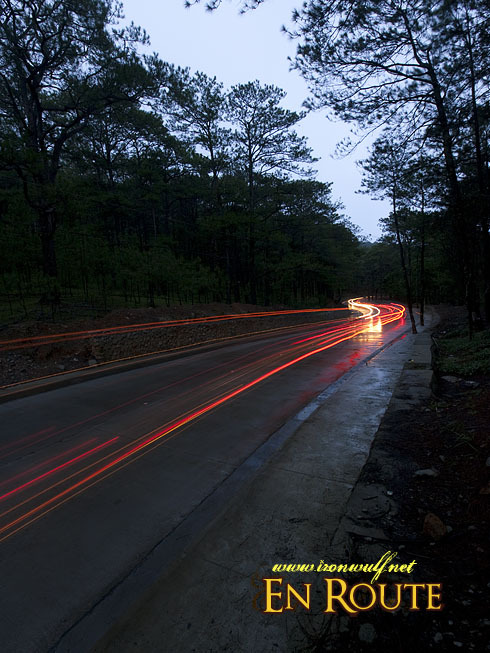 It was because local Baguio residences didn’t like seeing crosses lit up by their car lights when they pass through. There were a couple of crosses there left though situated under a tree. Probably the owners want them there still. 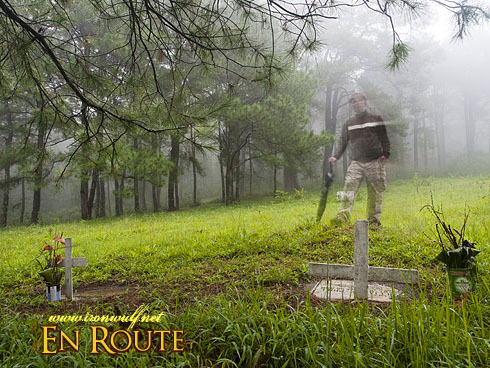 Baguio still has a few more ghost stories to tell. We can never really say if all of them are true unless we ourselves experience these paranormal occurrences. But let It be not mistaken that because of these horror stories that we should avoid the place. Somehow, these stories have been integrated into the City of Pine’s culture and character. And Baguio is a big place, this is just a small part of them. Even long before the Nevada Hotel and Hyatt Hotel incident (earthquake), the place is already believed to be haunted with a lot of stories said. There was even a big pine tree at the middle of the road which is believed to be the base spot of all the mysteries of the place. Ngayon ko lang nalaman yung story about the Nevada Square. After ng taping namin, we were invited to go there…not really my type of place. Tapos nung pumunta kami sa restroom, eerie talaga! Ang daming drunked girls and who knows kung ano pang kaganapan meron dun. Pero grabe ang experience ni manong ha! Scary! Is that Europa Condominium or The Concorde Hotel? 😛 XDD That playground was kinda familiar. If that’s the place I am thinking of then yes, I could say I’ve been there for a brief while when I was 10.
i think thats concorde hotel…. i heard a lot about spooky reviews about the place..